First there were nail varnishes in a glass faceted bottle with it’s tall slender cap inspired by calligraphy that transformed your regular mani into next level nail art. Then there were Loubilaque lipsticks you could wear as necklace that made lip service easy and chic. 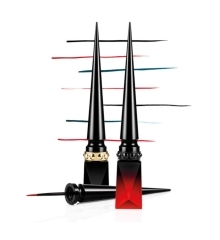 Now, Christian Louboutin is expanding his beauty empire with the launch of a new “Les Yeux Noirs” eye make-up collection. Inspired by the traditional Indian dance Kathakali, the four part eye collection includes a mascara, pencil eyeliner, liquid liner and brow definer. 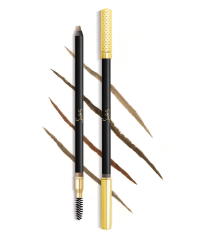 The range will comprise a “Lash Amplifying Lacquer” mascara, called Les Yeux Noirs, designed to offer a luminous effect, an assortment of eye definers dubbed Oeil Velours that include a “Velvet Eye Definer” eyeliner pencil and a “Brow Definer” eyebrow pencil, and the most exciting item in the entire line, “Luminous Ink Eyeliner” entitled Oeil Vinyle. 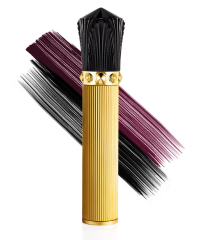 The mascara and eyeliners will come in shades of black, brown, the signature Louboutin with the eyeliner pencil also available in teal. 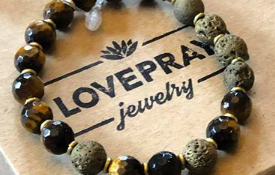 The collection will launch on March 23, priced between $40 and $75 (USD).